2018/2019 Junior Winter League starts from the 13th September. Good luck to all teams and don't forget to check here for news and updates about the league. 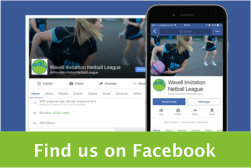 The new Wavell Invitation Netball Junior League got off to a flying start in 2013 and since then we have grown to a league of 54 teams across 6 divisions. If you would like to join the league as a player or your club be put on the waiting list please get in touch by completing the form below. Here are the league fixtures and results. Click the link and follow to the page. For more information regarding the Junior League, please complete the form below.